It was a job well done. A bonus point victory would have been the target prior to the tournament starting but after the shock Japanese victory over South Africa many a spectator might have settled for just the win. There are things to improve on after a five-try win over the Brave Blossoms at Gloucester leading up to the USA game on Sunday, but let's focus on the positives first. The 20-minute purple patch from around 50 minutes was brilliant. Scotland played with precision, skill and finesse and blew the Japanese away. Finn Russell was often the instigator of the magic and as the game wore on you could see the relationship with Matt Scott building and gelling, with the pair reading each other's body movements and exploiting the space. Mark Bennett also has the beautiful knack of finding his way to the tryline, making the three quarters a pretty potent unit. 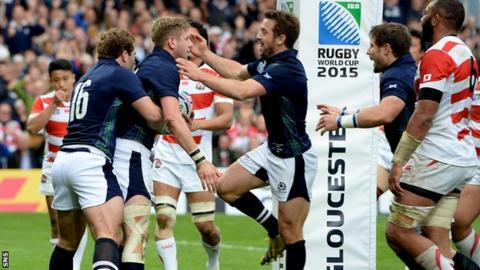 When Scotland were patient and accurate in the second half they looked dangerous. Against a tiring Japan, who had only three full days recovery after their famous victory, it seemed like it was only a matter of time before they scored. A sign of Scotland's progress in attack was the ability to concoct a backs 'strike play' from phase attack. It didn't lead to a try but the way Sean Lamont broke the line from an inside ball and then the link with Stuart Hogg on the outside was crisp and slickly performed. Scotland looked a little bit on edge in the first half but from 24-10 confidence started to ooze into their game and I hope they can maintain this from the start against USA in Leeds. Kick-off receipt is one area where I'd like to see a bit more adventure - or maybe it's just more variety. Often teams leave four in the backfield after kicking off which means there is space to manipulate the defence. Even if you play a couple of phases and then kick, I think it's worth doing. The Scotland backs are talented, athletic and brave and rather than just kicking the ball straight away and handing over possession I believe it's worth throwing the dice. Another reason for this is that Scotland are struggling to win turnovers in the tackle, which might be a cause for concern, and are therefore having to defend for long periods of time. The Scotland defensive shape was excellent on Wednesday barring a couple of instances of over-committing to the breakdown but against better opposition it will become a lot harder and more tiring to keep that effort up. The solution - don't give the opposition the ball in the first place. This doesn't mean don't kick at all but more a look at exploiting space, manipulating defences and kicking on the front foot. All in all, it was a very satisfying opening game - cobwebs blown away, bonus point in the bag - but they will be aware that they can't afford any inaccuracies and errors as the tournament progresses. I wonder if head coach Vern Cotter might rethink his selection plans for Sunday as a result of seeing how much the Japanese tired in the second half. Selection will be a fine balance but one thing is for sure this group of players are bubbling nicely.